Social evils in Indian society or for that matter in any society is not a new phrase and India is fighting since long to eradicate the prevalent social evils in it’s society like Poverty, castism, dowry, child abuse etc. However, India successfully eradicated some of worst form of social evils previously prevailing in it’s society like Sati & untouchability with the help of immense efforts made to spread awareness in society by Raja Ram Mohan Rai and Mahatama Gandhi. But when it came to Dowry System instead of changing the mindset in society by bringing in enough awareness, the Government has laid stress(under pressure from vested interests of NCW and WCD, radical feminists etc.) on using gender biased civil & criminal laws to curb this practice along with others relating to women. 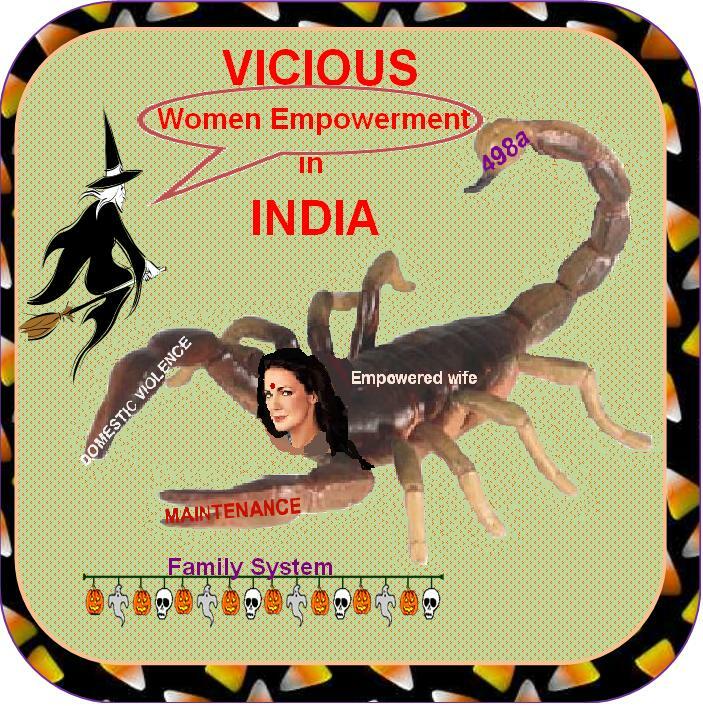 The Government in this process has mixed this social evil eradication with Women Empowerment which paved the way of gender differentiation in Indian judicial system and almost all the matrimonial laws or the laws of marriage in India are made gender biased favoring women which is resulting in gross misuse of these laws. Created and promoted by the Government of India and radical feminists. It is taking upthe shape of a tradition on the part of young empowered wives. Was practiced only on death of a husband. May start any time after marriage and many deaths could occur till the completion of it’s trial. Atrocities like physical, mental, emotional, economical and social harassment begins for the whole life of husband & in-laws and they caught entangled in a condition where it is neither life nor death to them. The loss of dignity, honor & humiliation many a times results in many deaths in in-laws & husband’s family. Was considered as a honorable sacrifice by wife. Husband and in-laws are portrayed as inhuman, criminals & monsters in society. Was having no financial dimension An open and legalized extortion tool. Was a bad, cruel and condemnable tradition underlying thinking that wife be free from all miseries in future without her husband Is more condemnable and cruel being a legal terrorism. Was a social evil effecting relatively (as compared to IPC 498A) small section of society. So easy to misuse that it is effecting whole society at large by propagating breaking of family system and criminalization of marriage system. So, after this annotated comparison, I am sure you are now somewhat convinced that YES, IPC-498A is a SOCIAL EVIL in India practiced & propagated by Wives ,Government, Judiciary & Police in India. But then, larger question remains that why not Government Scrapes this IPC 498a ? Is it still awaiting some more social reformist like Raja Ram Mohan Rai Or Mahatma Gandhi to eradicate this social evil, the child of their own misqued wisdom?